This is what I'm looking at the moment. For context see the earlier posts. Update: The channel on M1 is very important to look at right now. I am waiting for a test before pulling the trigger. Update: Still waiting how the channel test will pan out. In case of a new local high I might look for a long setup for a wave (c) within a triangle up to the 12000ish level. Update: I bought 1 CFD. 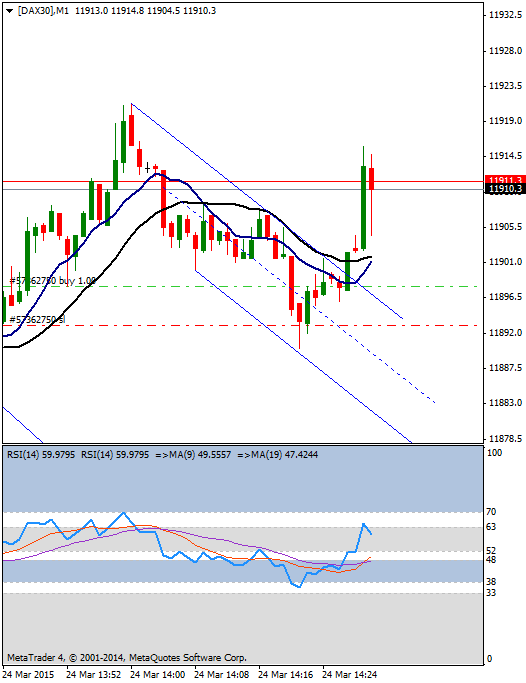 1 minute channel showed upside potential and because the break out attempt was intense engough I could slide my SL to break even and put my TP to 11995. We'll see how this one will work out. Update: Position got closed by the SL at EP. Now I wiill wait for another opportunity. The context of smaller timeframes are still open in either way. Update: I'm looking at a short setup on the 5 minutes chart. My entry timing has been a bit late, but the markert moved 1R already and let me move my SL to near break even. I did this because even if the H4 bearish bias will be valid, a little pull back may occur on the 5 minutes chart. 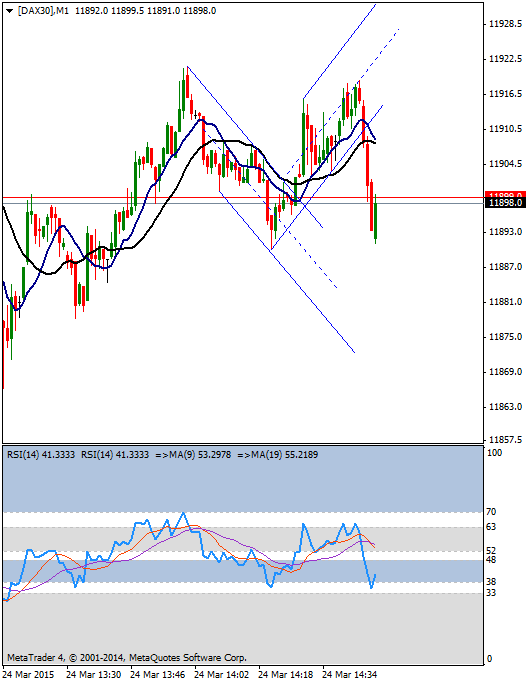 Update: Position got closed by SL at 11894. I will be taking a coffee break. Update: The fall from today's high looks corrective and the channel looks broken. Update: The market shows upward movement so I decided to follow the price action by manual candle trailing stop on 5 minutes chart. 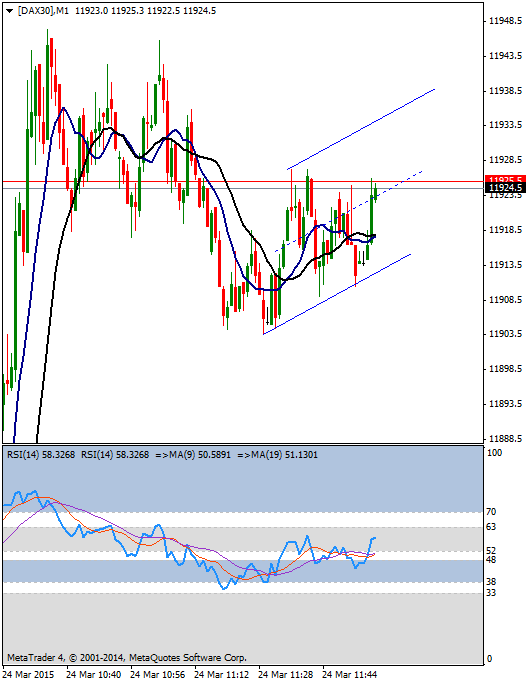 Update: Position got closed by SL at 11895. I give one more chance for this smaller degree long context. In my experience the DAX likes to make 1 or 2 pull back before a break out. Update: On the minute chart there is a small channel that was broken. I slide my SL a little closer to my EP. Update: I tried to stay patient and hold my Sl at break even. I got stopped out again. I made a bad decision not closing at the middle of a correction channel. I will seek reentry if the market stays above 11865, but now I'm waiting for another setup, I'll sit on my hands for a minute to see what is going on. Update: 1 hour chart gets interesting and it might creat a bullish setup, but it would still need some time. This is what I try to play out, although it might makes another leg before a break out attempt. Update: Upside movement is going on. I put my SL at break even. Fingers crossed. Update: I have to leave now. I put a trailing stop on my position and set the TP at 11195. Update: Position was closed. I still see potential in the hourly long setup and this is why I reentered the market on the long side for one last time today. Update: I raised my SL to 11961. It looks like the market proved my short term expectation. Even if I got closed out again I will be OK with today's performance, because I was able to adjust my first expectation to the ongoing price action. Update: I closed the position at 11984. Context: The setup on the 1 hour chart is nicely unfolding but it is possible that it will end soon. This scenario would need the RSI to stop at 63. The momentum on the 4 hour chart is still in neutral zone after rising from the bull support zone. On smaller time frames I think the index still needs a 4-5 topping procces. We'll see how it works out. This is just an expectation and no trading idea at all. Update: There is a long setup I try to play out. It is common for wave 5 to be qucik and may be it would be just a spike. Update: This looks like a triangle on m1-m5. Closed position at 12030. 2R in the pocket. Update: I can see a short opportunity, especially because the channel on the 15 minutes chart is likely to be broken soon. Since I started to type the market already has droped 15 point. Update: 1 hour chart shows a nice reversal candle while the momentum turned down from an ideal level. The position is still open, but the SL is very close. We'll see how it works out. Update: Last position is closed by SL in a slight loss. I'm done for today. See you tomorrow!